Do you have a passion for working with kids in an outdoor setting? Are you excited to learn about sustainability while passing on your knowledge to the next generation? Then get involved in our Hands-On Sustainability youth education program by becoming a 'Volunteer Educator.' Now recruiting volunteers for 2010. 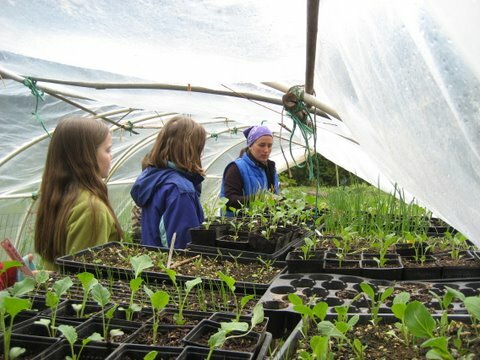 Our Hands-on Sustainability Program engages youth ages preschool through college in an interactive farm tour and hands-on activities and lessons on specific sustainability and ecology themes (gardening, natural building, forest ecology, restoration, etc.). There are opportunities for volunteers to develop ongoing relationships with groups that visit regularly. Volunteer Educators will lead youth field trip activities at Tryon Life Community Farm using activities from TLC Farm's Curriculum (examples here) and their own creativity. Training for each volunteer educator includes attending a training session and observing / co-teaching 1-2 classes before being the primary teacher for visiting students. Sign up for our next Volunteer Training! April 3, 2010 Contact emily(at)tryonfarm.org to register. Training is free and lunch will be provided. Volunteer Commitment: We are now recruiting volunteers who can commit to leading regular field trips throughout the winter and spring (although a longer commitment would be great!) Each volunteer will commit to leading a trip twice per month. We can arrange your commitment based upon your current schedule and the requests we get from interested youth groups and schools. Field trips are usually scheduled 9am and 5pm, Tuesdays-Saturdays. Requirements: Volunteers must have prior experience working with youth in an educational setting. Experience with sustainability education is a plus, but not required. Must be willing to have a background check if you do not currently work within a school system or other employer where it was recently required. For more information please contact Emily Gowen, Youth Education Coordinator.